Netflix issued a press release to announce that they will be buying back $100 million in stock in 2008. Stock repurchases under this program may be made through open market transactions and, from time to time, privately negotiated transactions with third parties, and in such amounts as management deems appropriate. The timing and actual number of shares repurchased will depend on a variety of factors including price, corporate and regulatory requirements, alternative investment opportunities and other market conditions. Repurchased shares would be returned to the status of authorized but un-issued shares of common stock. Wired featured Netflix in a story about companies using technology to change an old system (video rental) to be less damaging to the environment, Sustainability Scorecard Shows Green Business Has a Long Way to Go. 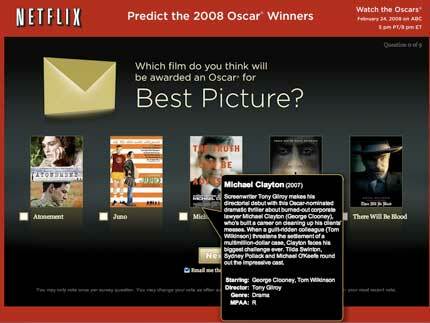 NetFlix is a prominent example of a company that leveraged web technology to create a new movie-rental system. Some environmental thinkers credit Netflix with eliminating millions of tons of CO2 emissions from consumers driving to video-rental stores. "The leading edge of sustainability is companies that have realized that green isn't simply about improving the bottom line; it's a way of growing the top line through new markets, new business models," Makower said. "And that's where technology companies can lead the way not just in inventing new solutions, but new systems." From the Netflix website: "If Netflix members drove to and from a rental store, they would consume 800,000 gallons of gasoline and release more than 2.2 million tons of carbon dioxide emissions annually." KHNL8 in Hawaii takes a look inside a "top secret" Netflix shipping center, including a rare video shot inside the facility. Swasey says if all seven million Netflix members drove to and from a rental store, they would consume 800,000 gallons of gasoline. "For $13.99 you get three DVD's out at a time, unlimited rentals so you can rentals so you can watch as many as you want and you can watch them online," Swasey said. Did Swasey slip up or is Netflix testing $13.99 pricing in Hawaii? There was an interesting poster in the video that read, "Netflix: Our Goal!!! To always deliver the correct playable disc the next day at a cost unattainable by our competitors." Tidbit from the story: Netflix has more than 50 shipping centers. Netflix has launched an online survey to collect your votes for the 9 major Oscar categories at Netflix.com/Oscars. You can see the real-time results after completing the survey, and the final results will be announced on February 21st. The Oscars will be presented on February 24th at 8pm ET on ABC. Blockbuster announced that they have opened a new shipping center in Oahu, Hawaii. Netflix opened a shipping center in Hawaii in December, 2004. Interesting tidbit from the press release: Blockbuster now has 39 shipping centers. Thanks to Ray for sending this in. What Will Happen To Netflix in the Next 2 Years? Rick Aristotle Munarriz travels through time and gives us an idea as to what will happen to Netflix in the next 2 years, Netflix in 2010. Blockbuster still rents movies, but that's just a small fraction of its business. The chain has become more like a RadioShack, making the most of its small-box footprint as a Jack of all trades that specializes in media entertainment. Some of its stores are even installing private home-theater rooms, so customers can enjoy fresh releases with a store-delivered meal. It's wacky, but I hear that some of the test stores have a waiting list for the weekend time slots. With Blockbuster out of the way, Netflix's biggest rival is Amazon.com. Once Amazon bought significant stakes in both Gamefly and Blockbuster's Total Access in 2009 -- buying majority stakes instead of outright purchases in complicated deals, to avoid the forced sales-tax issue through its namesake stores -- Netflix had no choice but to follow Amazon into video-game rentals. What do you think Netflix will be like in 2010? Netflix Rebates Instead of Tax Rebates? Dateline: Hollywood posted a silly spoof of the anticipated tax rebate, Congress and President Bush agree on Netflix rebates for Americans during Writers Strike. “When it comes to matters that are urgent — making sure Americans are watching enough television during this strike — Republicans and Democrats have come together to bring relief to the American viewing public,” said President Bush during a televised news conference. The rebates that will be sent out by the U.S. government starting in February will amount to three free rentals through Nextflix. Who Makes Netflix & Blockbuster DVD Mailers? I've been asked by a number of people if I knew who makes the DVD mailers for Netflix or Blockbuster, but I haven't been able to find this information. Does anyone know who makes the mailers for Netflix or Blockbuster? Both events will feature presentations by Netflix CFO Barry McCarthy, and anyone can listen in at http://ir.netflix.com. Flickr user Athena has posted a photo of a "Netflix Returns" mail slot at the Gramercy post office in New York City.